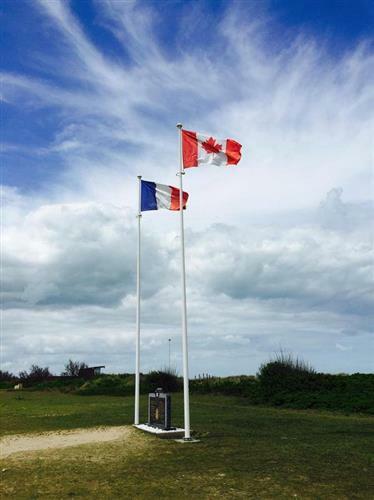 Veterans Affairs has much money so should be able to contribute to the Juno Beach Memorial!! We were close to St. Malo, but that was another place we didn't get to. 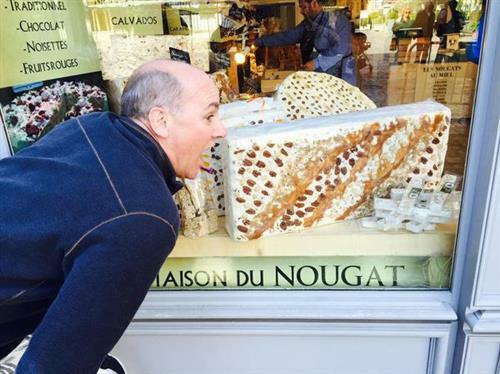 Jeff and Paul, what was your favourite meal in Normandy? I did bring back a little something for Bev and Marci, but since Marci was off today, I am holding off with the 'presentation' until all three of us are together, which I think is tomorrow. But here's a hint, it's NOT something that comes in a glass container! The coverage of scenery and history was great. Thank you for including the sidetrips and the respect displayed covering war locations and events. I made my way through the trip eating great French salads...wonderful... I held off on having too many pastries..although they were available in every other store! I also had a baguette or two, but quickly walked them off! Where would you like to go next, Jeff? Paul? I think my favourite meal was in Honfleur.. I had a great dinner with fish and risotto. 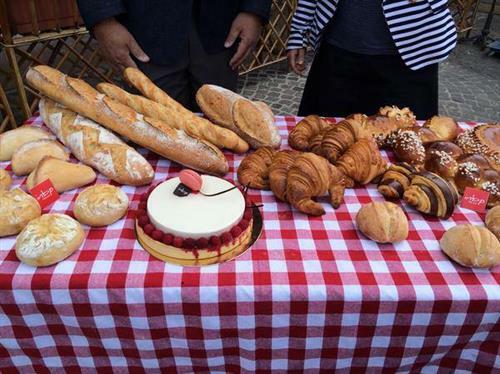 The food in Normandy is fantastic! 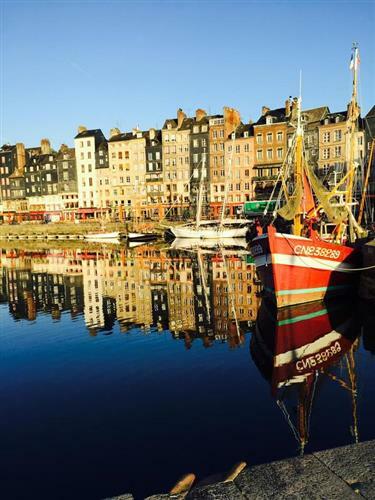 The picture just posted of Honfleur was taken at 7am during one of my morning walks. It is my favourite picture from the trip..
How many steps on your Fitbit, Jeff? Beautiful pictures of your wonderful trip and we so like all your comments. You make the news fun to watch. I hope you had a chance to try some good home made Calvados too. Producer Jen, that's a tough question. We still haven't featured the Bordeaux region of France. I don't want to make the sponsorship issue at the Juno Beach Centre a political thing. They get government funding, but also rely on corporate sponsorships. They lost their last big sponsor so are now looking for another. Their number is 500K a year, a small price to pay to keep the honour, tradition and memory of our military men and women going..
JunoBeachCentre, we definitely did. I had never had Calvados before. 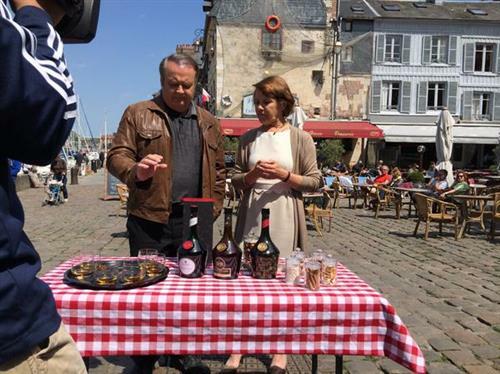 I tried Calvados and Benedictine and Cognac the same day...the tasting one that particular day continued a little after the show ended! The river cruise looks like an amazing way to see places. What did you like most about it? I just got my Fitbit report, and while steps are one thing, I'm more inclined to look at the number of calories I burned off...and that's why I climbed the Eiffel tower! And to add, Jeff climbed the Eiffel Tower after a full day of shoots. We shot three pieces before he did the climb. Nilesh, you're definitely right. The crew was amazing. How many hours a day did the crew work? Jeff is very involved in everything he does. 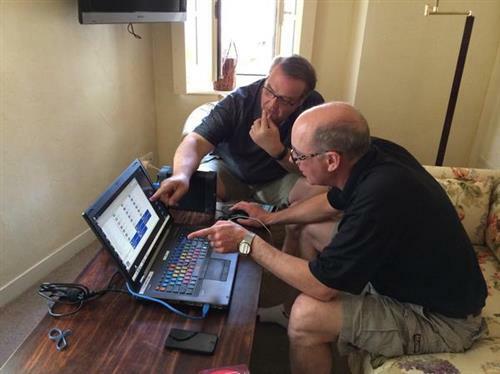 Jeff and Francois were editing his tour of Honfleur in that photo. Please continue to do shows like this. Just loved it. Looking to see where they send you next. We just love What's new on the Internet, too. Makes our mornings. Dogs have to wait until it is over before we can do our morning walks. Hey Catherine, I answered this a little earlier so just scroll down for the answer, but it was the last day at the Juno Beach Centre...although I will admit I loved being in Paris for 3 days, but it would have been much better had my wife Heather been with me! Salty, every day was a bit different. It all depended on how much travel we had to do after the show. We arrived at the live spot around 10:00am (local time) and finished the show at 3:00pm. We would then get into a van and travel to the next spot. Jeff did you do carry on? We also did a lot of shooting and editing on this trip. Most of our pieces were shot the weekend before the first live show in Paris. For sure the Juno Beach Centre, can totally understand that, but I guess I was wondering about being on the cruise itself - the views from the river, the food, etc. Have heard it is such a different way "to see" things. Alas, I did not do just carry on. Although I only took one extra pair of shoes, I needed a different outfit for each day of the show, and I also tried to wear something different when I was shooting our individual pieces that ran on the show..ex, Giverny, Paris tour, Versailles. Also, I had to be prepared in case there was a seagull 'incident'...and there was! Was there much Down time or was it all work? Salty, there was a lot of work to do, but we generally had some down time in the evenings. Just to clarify, we were not on the actual ship as it sailed. We travelled by car to our remote locations, and we did this because of timing. 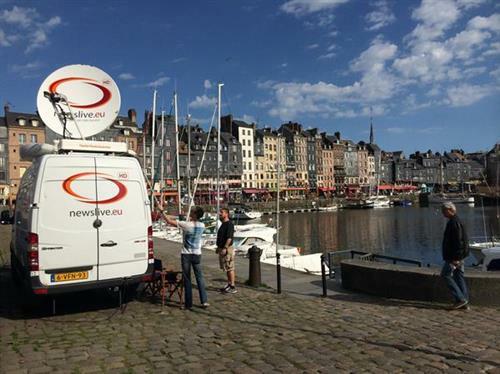 We actually met up with the Scenic Gem in Honfleur, but by not being on the boat, we were able to do shows in Paris, Rouen and Normandy. These are all places the cruise goes and people get to tour. We did a show from the boat, just like last August, and it can only be described as impressive..and the people on the boat love it. Our crew consisted of four people, and with only 64 rooms on board, getting all of us a spot wasn't feasible. !